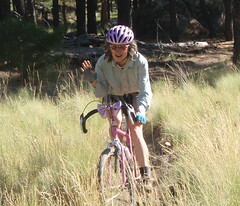 Right: idyllic riding in Flagstaff Arizona. Morgan (fnagrom, to you), Lauren and I rolled into the high desert of northern Arizona to visit Joe Murray (podium pal) and his mate Kim while un-hurrying our way to Single Speed Worlds. My saddle was slipping by the end of each ride, so I borrowed a hex wrench and tightened the seat post clamp. That is, I put the wrench in something back there and turned it. It seemed to make the seatpost tighter. This act of Feminine Tool-Wielding Empowerment would have repercussions two days later, while “racing” SSWC. The race day dawned clear and sunny. The town park was swarming with excited racers, half of them waving cameras around. I questione my need for my fanny pack, and at the last minute stashed it, knowing that there would probably be some sort of refreshment out on the course, and I nearly never get flat tires. The hour and a half uphill push was Brutal (the only word anyone used to describe that slope). With leaden legs, I swung into the saddle for the Raiders Ridge rock garden . Durango town, the winding Animas river, and a hundred ticky-tacky tracts shimmered thousands of feet below . Maybe one thousand? Looking fixedly away, I attempted a crux move along the stepping-stone rock ledges involving a backward shove against the seat when the saddle dropped. Hopping off, I realized the quick release was gone. In fact, back in Arizona, when I ‘tightened’ the bolt, it was the wrong bolt. I apparently was actually loosening the little bolt that holds the bigger bolt in proper adjustment…so the whole thing fell apart on the trail. Luck was with me, though: my friend Salida Scot (who had only the day before told me how nice that q.r. was, all hand-made) spied it, scooping it (and the bolt, and little stainless steel meniscus) out of the dust a mere minute later.. So I owe him a wombadge. The collar simply needed reassembly. I want to get the true story out because Charlie’s bikes Rarely Fail Their Rider. They can, however, be thwarted by certain well meaning wombats. For the umpteetnth time, I am re-learning the basic fact that I should never be given a tool… A copper plaque in Charlie’s atelier, er, shop proclaims “J.P. completed the course in advanced bicycle mechanics at the Barnett Bicycle Institute”. Underneath the inscription some felt-tip graffiti artist complained: Yeah, but it didn’t help any! ~ by jacquiephelan on September 26, 2009. I have rebuilt a Volkswagen engine, and fixed more sewing machines than I care to count, but somehow or another, I can be almost guaranteed to screw up my bike. We need a pic of the sweetest QR lever ever! D’oh, there are the pics on the right.